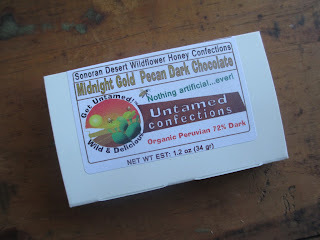 One more chocolate sweetened with honey from Untamed Confections. This time we have their Midnight Gold Pecan Dark Chocolate, made with organic, fair trade 72% chocolate sourced from Peru. The face of the bar looks the same as usual, but flip it over and you'll find a treasure trove of pecan halves. Such big pieces give everything almost more of a chocolate bark look than a chocolate bar look. In a couple of places, you can see some honey over the pecans. Given that I've already talked about the plain chocolate from Untamed Confections, I find that I don't have much to add about this bar; maybe my mind is just bouncing around too much lately to sit with all the details. So I'll get right to the point: this is a pleasant bar of chocolate. Though there are so many large pieces of pecans, the amount doesn't feel like too much because the chocolate is thick enough to handle it all. And the slightly different texture of the honey chocolate lends itself well toward chewing and crunching. You don't taste quite as much of the honey element in here as you do with the plain chocolate because of course the pecans take up a large part of your attention. And how lovely the pecans are; they have plenty of warm flavor. Occasionally, you do get a slight taste of salt (it's fleur de sel) and sometimes even a stronger hit of the vanilla. So each bite isn't exactly the same (as is naturally the case, anyway, for a chocolate that has another product sprinkled on it in this style). Untamed Confections has a good thing going right now. Because of how closely it resembles bark, this bar is more in the confection range. And yet the ingredients are good--and also not in that, um, hippie style that shall we say, alternative chocolates sometimes have. This chocolate still tastes and feels like chocolate, even if the use of honey instead of sugar makes it a little different. It's more natural without being too odd and has quality ingredients without being all shiny and posh; the general style is more natural. I almost want to call it chic. Distinctly Arizonan, that's what I would call this chocolate--because of the Sonoran Desert wildflower honey but also particularly right now because of the pecans. Pecans make me think of all of the pecans in Camp Verde. Yes, distinctly Arizonan chocolate.